The first Bute Dock opened in 1839 and expansion continued until the fourth major dock opened in 1907. Ownership remained with the Bute Dock Company (known as the Cardiff Railway Company after 1897) until 1922 when the entire docks were sold to the Great Western Railway Company (GWR) for a nominal £5. When GWR disappeared in the railway nationalisation of 1948, Cardiff Docks came under the control the British Transport Commission (BTC). In 1963 when the BT Commission was dissolved, ownership passed to the British Transport Docks Board (BTDB). Then in 1983 BTDB became one of the first nationalised industries to be privatised. When Associated British Ports Holdings Plc (APB) took over, the privatisation process was carried out in two tranches. The first was in February 1983 when the government sold 49% of its shares, with 2.5% going to APB staff. The second tranche took place a year later in April 1984 when the government sold 48.5% of the shares. So after 35 years of national ownership, Cardiff docks had come full circle and were once more in private ownership answerable to shareholders. Through this process of amalgamation of railway and dock companies, APB became responsible for the operation of nineteen cargo-handling ports around the country, all policed by the British Transport Police. When APB settled in they found that they had a policing service over which they had little control. They had no opportunity to participate in policy making or operational planning and this did not sit comfortably with their new responsibilities to shareholders. And for an organisation intent on making a profit, the cost of the police was also a major factor and quickly drew the attention of the accountants. In 1964 BTDB had paid out £298,926 towards it’s policing service. By 1981 that figure had risen to £2,999,000 almost exactly ten times as much. On average, this meant that costs were more than doubling every two years. APB were well managed at senior level and knowing that they had no legal responsibility to maintain an independent police service, the company quickly decided to dispense with the services of the British Transport Police. It was arranged that the police service would be withdrawn in April 1985. But it was not without a touch of irony: had you been watching a particular ITN news broadcast early in 1984 you would have seen two consecutive law and order related items in the same bulletin. The first came from Margaret Thatcher’s crime-busting government announcing a security clampdown on the illegal importation of drugs through British ports. The next item announced that the police were being withdrawn from twenty-four ports nationwide. It’s a funny world sometimes. This withdrawal had a major impact on British Transport Policing strategy. Officers serving at dock police stations were accommodated at other police posts where possible with many officers being transferred to London stations. Some officers were given the opportunity for enhanced early retirement but there were no enforced redundancies. It also meant that the force now once again policed just the railway and London underground networks. In the thirty-seven years since the formation of the British Transport Commission Police, police services had been withdrawn from the canals and rivers of British Waterways, from London buses and British Road Services on the highways and now from nineteen ports around the country as well as five passenger ports and the Sealink cross-channel ferry services. In many respects, they had gone back to their roots to once again become the railway police. In the early nineteen nineties APB twice made exploratory approaches to BTP about re-instating a dedicated police service at it’s ports. But by that time the railways had also been privatised and legislation now confined British Transport Police jurisdiction to ‘railway operators’. A further act of parliament would therefore have been required for this to happen. It was too late to turn the clock back and no further progress was made. By the appointed day of withdrawal, the 13th of April 1985 there were only a skeleton police staff left at Cardiff Docks and it fell to two long serving officers to switch off the lights and lock the police station doors. 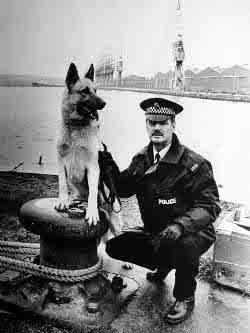 Pc Keith Williams had been stationed at the docks since he joined the force in 1966. Dog handler, Pc John Mellor and his dog ‘Chas’ made the last patrol of a hundred and twenty-seven years continuous police service.